During eighth grade, now Rev. Mr. Steve Kiernan’s parish celebrated a county-wide anniversary Mass for the Scranton Diocese. The current deacon assisted at Mass as a member of the Boy Scouts. Sitting in the rear of the church, he remembered the bishop standing to thank people and speaking about vocations to the priesthood. “I’m in eighth grade, and I never heard that word before,” Deacon Kiernan said. Did the bishop pronounce the word wrong? He said vacation, right? The bishop wasn’t promoting a sunny day at the South Jersey shore but encouraging people to approach young men experiencing a call to the priesthood. Then, he extended his finger out toward Deacon Kiernan. Deacon Kiernan never forgot that moment, not as a lector during Sunday Masses at Penn State University’s main campus, nor a seminarian at St. Charles Borromeo Seminary in Wynnewood. 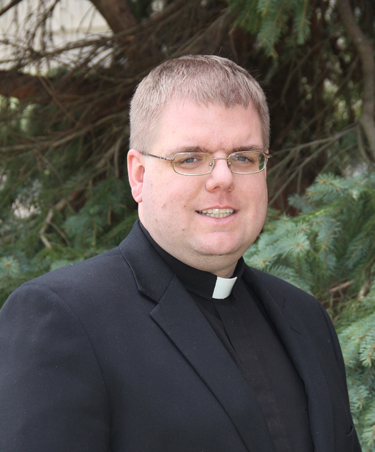 Eventually it would lead to this moment: On Saturday, May 16 he will be ordained a priest for the Philadelphia Archdiocese by Archbishop Charles Chaput at 10 a.m. in the Cathedral Basilica of SS. Peter and Paul. Involved in Penn State’s Catholic Community, currently the Catholic Campus Ministry, the now deacon Kiernan became reinterested in his Catholic faith while attending college. As a senior, he became treasurer of the Newman Club, a Catholic campus organization at University Park, Pa. These organizations helped him rediscover his faith. Flipping chicken sandwiches and selling hot dogs, he volunteered at a Beaver Stadium concession stand as a co-manager to help the Students for Life and Newman Club raise money at football games. Rev. 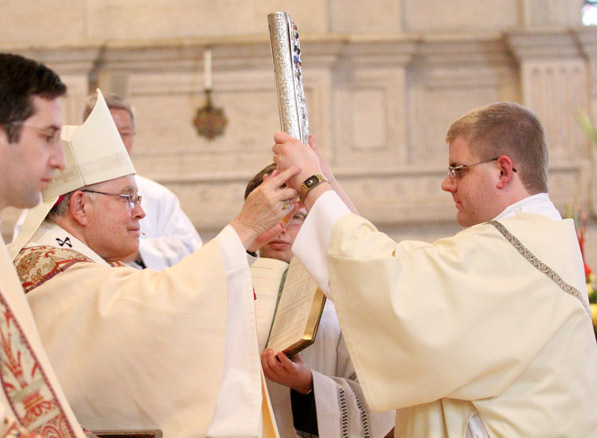 Mr. Steven Kiernan receives the Book of Gospels from Archbishop Charles Chaput during the rite of ordination as a deacon in May 2014. At Penn State, he made good friends and still contacts them. After graduation in 2002, the soon-to-be priest looked into a government job in Washington, D.C. The application process put him through a thorough background check due to the terror scare after September 11, 2001. At that point, the priesthood wasn’t on his radar. While awaiting the background check’s results, Deacon Kiernan received a telephone call from a company offering an interview. Proposing a better salary and closer to the Poconos, his home, Deacon Kiernan took that latter job as an analyst and project manager for a health-insurance company in Fort Washington, where he settled as an adult. Deacon Kiernan liked the work but experienced a tug to pursue something more, entering St. Charles Borromeo Seminary to study for the priesthood. Making that step in 2009 was tough and time consuming for Deacon Kiernan because he had a career, house and car — a buildup lasting seven years. Now, he has no regrets, though he misses the work lifestyle on occasion. Msgr. John Savinski, pastor of Our Lady of Perpetual Help in Morton, Deacon Kiernan’s internship parish this past year, lauded the soon-to-be priest’s organizational skills and his sense of prayer and liturgy. He’s also very reliable, accomplishing the tasks he sets out to do. Father Cioppi will be the homilist for the new priest’s first Mass on Sunday, May 17 at 4 p.m. at Mother of Divine Providence Church. Deacon Kiernan said becoming a Catholic priest in the Archdiocese of Philadelphia wasn’t even a thought 14 years ago. Now, it’s become a reality. Freelance writer Brendan Monahan may be reached at bmonahan16@gmail.com. He also has a website, BloggingBlocks.com. Visit the site or like the Facebook page. So proud of you Steve!